Since December 31, 2012 Tanzania started migrating from analogue to digital broadcasting. The implementation has been successful by 100% which makes Tanzania the first country in the East African Community (EAC) and Southern Africa Development Community (SADC) to meet the deadline imposed by the International Telecommunication Unity (ITU). In fostering this process StarTimes in partnership with SmartCodes is now running a campaign which offers an added value to digital broadcasting. Digital broadcasting which allows the consumers to choose from multiple methods of receiving television signals has given innovators at SmartCodes and Startimes the opportunity to make TV more private and personalized. 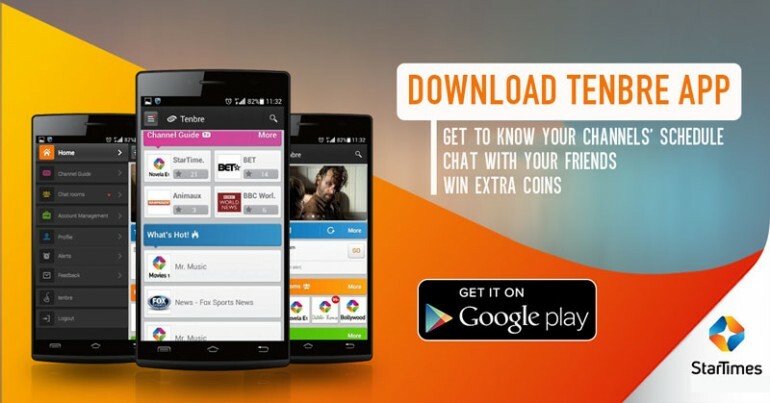 Tenbre a mobile application that can be downloaded for free allows the user to access StarTimes guide wherever they are and share it. With this mobile application the user can; find out what are showing in the next 7 days; sort all channels according to countries, regions, genres and bouquets; create their own favorite channel list; search shows or channels by the title; see what shows are on air; see the ranking order of the coming shows; see recommended shows and channels; set reminders for any show they like; view their wallet; receive their tasks and gain coins; alert setting; view their reminders and favorites; invite friends and get free coupon for recharging; access user friendly chat room; top post in each chat room for easy viewing of up-to-date information; support long press to copy text in chat room; support directing web links by clicking on the link; view number of people currently online in each chat room hence the number of people who are watching particular TV at that particular moment. All this has been made possible on the hand of the consumer. It is of great honor that SmartCodes and StarTimes have pioneered in digitizing Tanzania. The big idea here is merging tradition with modern which is what SmartCodes envision. SmartCodes believes that if the government of the United Republic of Tanzania continues to support such initiatives by making them more accessible and affordable by year 2020 Tanzania will be the hub of technological innovation in Africa. As we say in SmartCodes technology is for everyone and so it ought to be. SmartCodes is the awards winning Tanzanian full service digital agency. SmartCodes is a single stop for all digital pursuits. Over the past 5 years, the commitment of the innovative minds you could find in the industry has contributed to the dynamic growth of Digital Industry not only in Tanzania but Africa. SmartCodes has contributed immensely on the exponential growth of digital products consumption in Tanzania. Currently Tanzania has about 31.86million mobile phone users and of that about 40% uses smartphones. With that rapid growth SmartCodes is now servicing a vast portfolio of clients across the sub-Saharan Africa. Quality, on time delivery and on budget has been their strongest reputation.